We need a thread to discuss random John-related topics and issues. I'd like to start with this question: It has been suggested by different sources that John may have actually had a "thing" for Astrid, but because of his devotion to Stu, he never pursued it; rather, he just suffered in silence and wrote Baby's in Black for her. Or that maybe he DID try to pursue it and she rejected him. Personally, I'm not sure what I think... although it definitely makes sense that he would fancy her. She was sort of his dream girl type, after all. Beautiful (and blonde a la Bardot), arty, bohemian, a strong woman. I think he most likely had a thing for her but it may have been more of just a physical attraction than anything, although she was an artist and he seemed to aspire for that in a partner. I think, due to the fact that his best friend was in love with her, he didn't try anything. I think those stories- like perhaps the underlying tension in the film Backbeat- are trying to add more to their relationship than there really was. 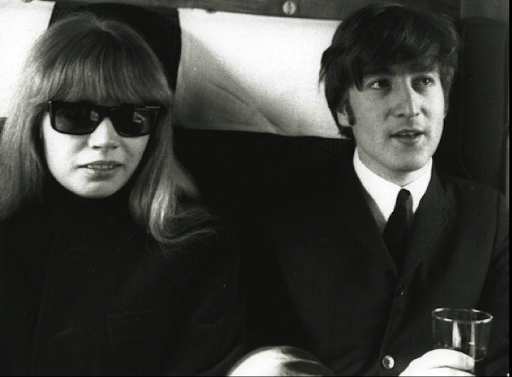 I think Astrid definitely loved John, but more like a brother. She speaks very highly of him so I'm pretty sure he never attempted anything other than innocent flirtation. But, you know, that is just my opinion. I think you're spot on. You pretty much articulated exactly what I think on the subject. Ok, so next topic, I guess. Do you think John would have ever recorded with Dylan? I think that would have been a cool collaboration in, like, the 90s/early 00s. And I would have loved old John to collaborate with old Lou Reed and possibly have Laurie Anderson and Yoko out there and do some kind of Plastic Ono Band show with people like Mark Ronson and the Black Keys playing along. I'm so out there with my ideas for old John. lol! Last edited by Apple Scruff : Jun 17, 2011 at 09:05 PM. Yes, he was... end of discussion. I think I'm inspired to make a thread about John's physical allure...yay! Even by it’s very rarity, it carries a certain kind of excitement to it. I am talking about the absolutely debilitating effects, you know, like hearing about how John Lennon would throw up before a concert! I am talking about the “scared to death” kind of feelings. I am talking about things that makes us play worse, not better. It seems like his worst cases of stage fright occurred when he was unsure how he would be received. Like in Toronto and in Madison Square Garden... he wasn't sure if people were going to be happy to see him on stage. (What an insecure twit our Johnny could be!) Elton John and others who were there that amazing Thanksgiving night have said that John received the loudest, longest, wildest reception they had ever heard when he stepped out on stage. It's sad that John didn't always know how deeply people felt affection and admiration for him! Last edited by Maia 66 : Jun 18, 2011 at 02:35 PM. It seems like his worse cases of stage fright occurred when he was unsure how he would be received. Like in Toronto and in Madison Square Garden... he wasn't sure if people were going to be happy to see him on stage. (What an insecure twit our Johnny could be!) Elton John said-- and others who were there that amazing Thanksgiving night-- that John received the loudest, longest, wildest reception he had ever heard when he stepped out on stage. It's sad that John didn't always know how deeply people felt affection and admiration for him! "People seem to think I'm anti-Christ or anti-religion but it isn't true. I'm a most religious fellow." He was always humorous- like a musical Monty Python. LOL ~ I was just watching that part of the Anthology yesterday as I was getting ready for work! I had to turn off the tv at that point and it totally made me smile!! I think that came from the 1970 Jann Wenner tapes, which strikes me as even more interesting... since he was supposed to be all bitter and rancorous, as the conventional wisdom goes. Plus, I think he really meant to say that he was spiritual, because I don't think John was ever religious... he WAS, however, spiritual. it was after the Jesus statement, they came to my neck of the woods and i really think that incident and the fireworks he thought were gunshots brought the beatles touring to an end. btw, i live south of memphis and they played 2 sold out shows in memphis. i know you have seen the clip of brian saying they had sold out since the statement...always made me feel like there redneck take that. Plus, I think he really meant to say that he was spiritual, because I don't think John was ever religious... he WAS, however, spiritual. I agree. Although the song "Help Me To Help Myself" (I need some money for all the promotion I'm doing for that song) points to him singing about The Lord: "please help me Lord...help me to help myself..."
Gosh it's hard to really put a thumb on him but I think, more than anything, spiritual would be the best word to use. His quote about Gaughin in the Beatles Anthology points to a depth that goes beyond just relating parts of a famous person's life...he was thinking about the reason for living/dying, etc. Very deep stuff. Everyone who was there relayed how it was the greatest/most thunderous applause ever heard at MSG. John was totally a legend in his lifetime. I think he WAS aware of it to a degree, but he wrestled with moments of self-doubt. Next thought: John's arrogance...I love it but I'm going to own it...the man was truly without question quite full of himself at times. in the Jesus apology he says "God as a thing or whatever it is" ...i think that's the quote...and by the song grow old he's saying God bless our love. so i think he was spiritual..and that is a good way to put it. What's that quote? Something like, "Half the time I think I'm a loser and the other half of the time I think Im God Almighty!" His personality had so many contradictions. If you study history, you'll find that most of the truly great and interesting people were FULL of contradictions! But actually, John's arrogance: the stance, legs apart,eyes narrowed, very serious expression as he sang really SCARED me as a child. I was far more inclined towards George because he was cute, young, and innocent looking. However, John's songs were always the ones for me. So as I came to read/watch more about him I recognized that, although he could be arrogant, that was not by any means a defining aspect of his character. It's funny you read the quote he says and than read Helen Shapiro calling him a sweetheart and the "most gentleman" of all the Beatles. I know. My parents were such barbarians. But of course my dad had no problem watching Miami Vice and Magnum PI with me any time. lol! But actually, John's arrogance: the stance, legs apart,eyes narrowed, very serious expression as he sang really SCARED me as a child. He must have been something to see on stage in the pre-megastadium days! That arrogance was part of his immense charisma. After all, he could back it up... he was hot s**t and he knew it. He used to go around Liverpool when he was a young kid (like 7 or something) and get on the bus and declare to strangers, "I'm John Lennon!" as if he knew he was something special. But the more sensitive side of John also had that insecurity.... and also that honesty to say, "I'm just a person like anyone else. Who am I trying to BS?" I call it the Burden of Perspicacity. When you have that ability that John had to clearly see through things, to understand people for who they are, to be incredibly perceptive... it seems like a blessing but really it's a burden, because it carries with it that other side. That side of KNOWING what a drag people can be, of knowing that NOTHING is so special that we have to hold it more precious and high above everything else. John had that... and it came across as arrogance.